I discarded this modification. With perfectly adjusted carburetors the best performance is reached with standard manifolds. If the engine performance is better with tube or bottle, then this is an indicator for a suboptimal carb adjustment. 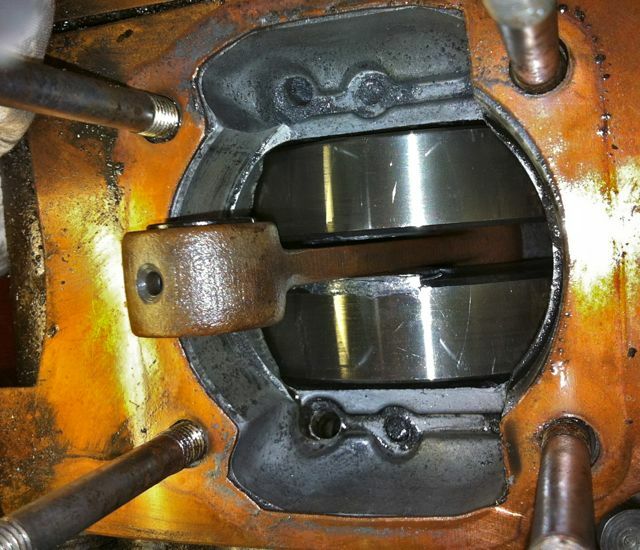 Colleagues from the YPVS scene report that the performance withoutcross over pipe is better, but the bike tends to the typical two-stroke part load jerking. 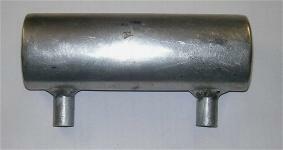 This modification of a stock muffler has not brought the expected result. 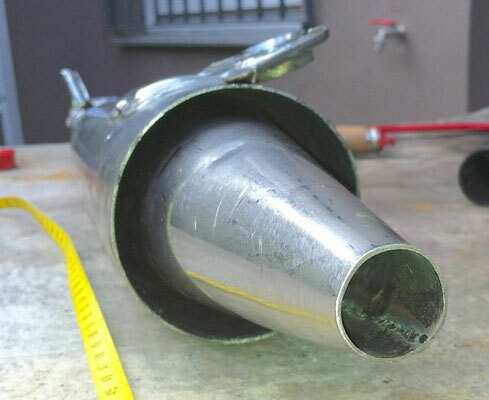 The first baffle plate was removed and a 18 cm long cone inserted that starts 70 mm before the first baffle. The diameter of the cone is 80 mm at the entrance and 20 mm at the outlet. With a shortened whistle the noise levels achieved is a little bit above the series. The pictures shows what happens if you haven’t had looked too long after your lead weights in the crankshaft and use you engine between 7000 and 10000 rev. 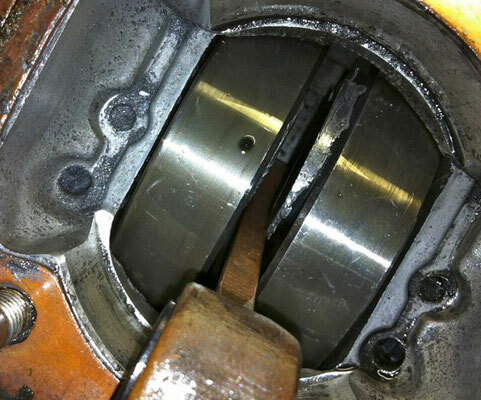 Differently from the late RD400 poured lead weights are part of the RD350A/B crankshaft. The weight from the left side dropped out after a little tip with the fingernail (fig 1-3). 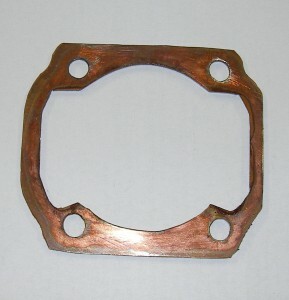 To change the porting reversibly, use a 2 mm copper base gasket. I sawed it from a copper sheet from Conrad Electronik. Compared with the paper seal all channels move upwards 1.5 mm. The speed of maximum torque rises for about 300 in rpm. 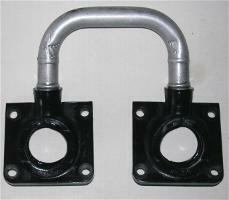 To keep the compression constant mill down the head by 1.5 mm. I do not recommend this measure any longer as the engine looses torque while increasing revs by 300 revs. The performance remains unchanged! Best results has been achieved with a 0.8 mm copper gastket. A window is cut on exhaust side that open the crankcase for about 3mm x 14.7 mm to the exhaust duct. 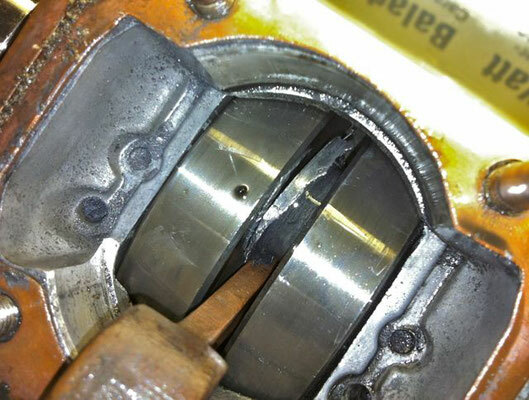 The torque rises between 2000-5000 1/min slightly. No difference is felt in upper revs. For facing a racing engine this modification is pointless. 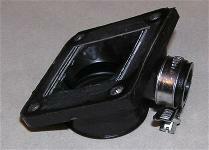 Piston window on outlet side.